Spring is finally here, even though the weather may not show it yet. Don't let the rain and cold put a damper on thoughts of warmer weather... we've added some new cocktails to put you in the right frame of mind! 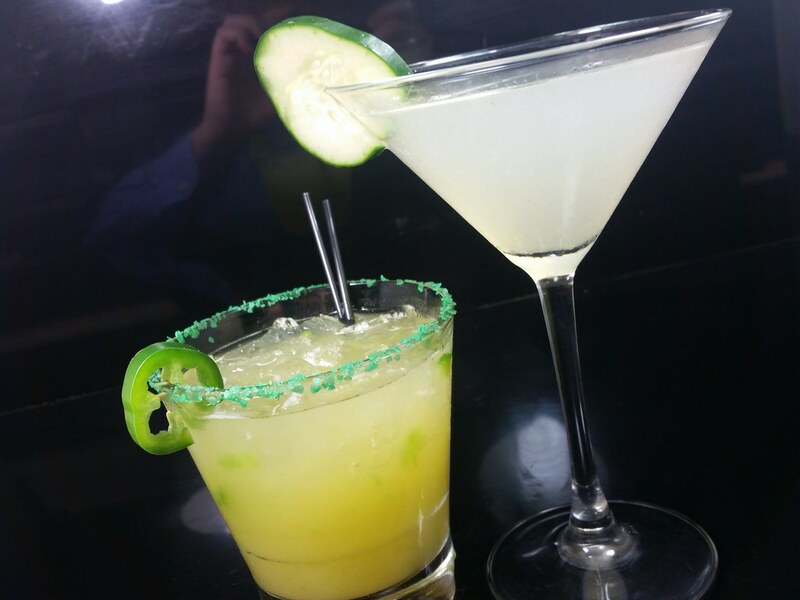 Starting with something spicy we introduce the Jalapeno-Orange Margarita. It starts with freshly muddled jalapenos before we add Solerno Blood Orange Liqueur. It is then finished off like a classic margarita with tequila, sweet and sour, and just a splash of orange juice. Next on the list is the Blueberry Smash, a creation from the mind of mix-master Kim. She starts with fresh blueberries and just a pinch of brown sugar before she muddles it with lemon juice. Finished off with some spiced rum and a splash of ginger ale, the result is a perfectly smooth and sweet concoction. On to something a little lighter on the palate... the Cucumber Elderflower Martini. It starts with Hendricks gin (infused with rose petals) and St. Germain Elderflower liqueur. We then counteract the sweet and floral with freshly squeezed lemon and lime juice before it is topped off with a fresh cucumber slice. Light and elegant, it's an embodiment of springtime. Finally we have the Spring Time Fizz. Close to a gin fizz, we substitute for a little more sweetness. We combine blue curacao, pomegranate liqueur, and pineapple juice before it is topped off with ginger ale. It's finally time to start ditching the heavier portioned meals and warming drinks and get ready for something a little cooler and sweeter. The weather will change soon, and so will your appetites. Let us get you started off right with these new spring cocktails. But stop in soon, because before you know it, summer will be here!